I'd love to have one of these in my town. 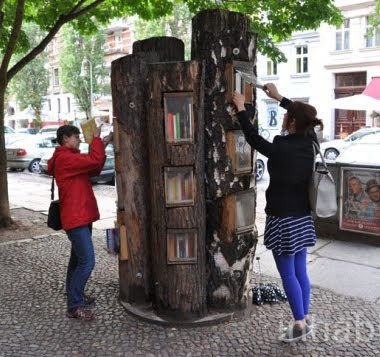 In Berlin, a non-profit educational institution for women working in the building enterprise called the Baufachfrau created the "Book Forest" in 2008. The project is part of the BookCrossing, a book swap club which brings free books to public spaces around the globe. Read more about the Book Forest and see photos of its installation and learn how to take part in a BookCrossing Swap at Twisted Sifter. Find out more about Baufachfrau here.